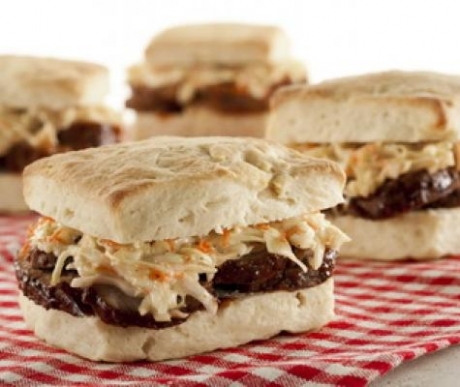 These mini sandwiches are perfect for entertaining. Serve them at your next spring get-together. 1, Prepare biscuits according to package directions. Let cool completely, then slice each biscuit in half. 2. Set pork tenderloins on a cutting board. Combine seasoning, red pepper flakes, black pepper and salt. Rub onto all sides of the pork tenderloins. 3. In a Dutch oven, heat canola oil to medium-high heat. Sear all sides of the tenderloins, cooking about 2 minutes per side. 4. Remove from heat, and pour Bar-B-Q Sauce over tenderloins. Cover, and cook in a 350 degree oven for about 45 minutes, or until internal temperature reaches 145 degrees. Remove from oven, and let sit for 5 minutes before slicing. For easier slicing, let pork cool even further. coleslaw, pickled jalapeños or any favorite condiment.